The horns fetch huge prices in some Asian countries where they are used for medicines and jewellery. Nepal is home to about 645 rhinos, out of which about 600 live in Chitwan National Park. 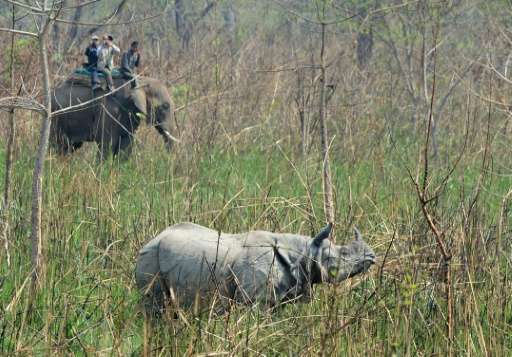 The park is in the process of relocating five rhinos to another conservation area in far-west Nepal to boost their population. "We hope that the investigation will help us devise new strategies to strengthen protection for these animals," Jnawali said. Rhino poaching carries a maximum penalty of 15 years in jail and a 100,000-rupee ($1,000) fine. I urge as many of you as possible to get as much hair from your local hairdresser as you can, ram it into a mold, and sell it as rhino horn to the callous morons that still think this has any physiological effect at all. Flood the market with indistinguishable fake horn and send the price plummeting. No incentive-no extinction.